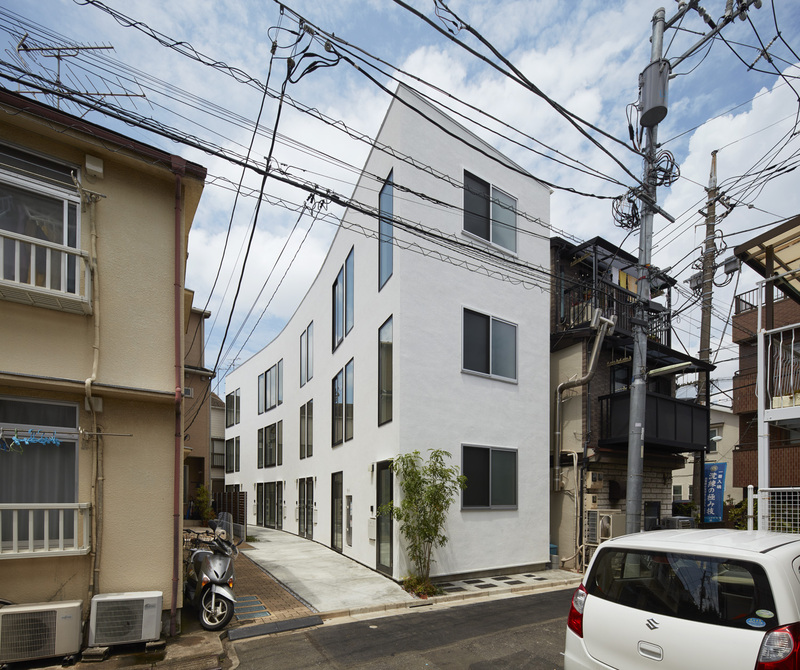 naf architect & design Inc.
A long three-story flat which consists of 6 dwelling units, 3 studios and 3 duplexes, stands along private passage diverged from the street in front of the premises. Behind the entrance doors of the flat is White Layer, long and thin space whose entire surface is painted in white. Behind the White Layer is living space such as kitchen, dining and living room. White Layer is facing south along the private passage, functioning as buffer zone between the passage and living space while receiving sunshine and wind from the passage and delivering them to living space. In terms of room layout, White Layer is where corridor and stairs are located, traffic line inside the flat, sometimes used as earthen floor, entrance, sun room, and work space. 6 dwelling units have different room layouts but share the same structure of White Layer/ living space. Residents would go out from White Layer through private passage to street in front of the premises and to local community. The flat building with simple facade draws a slow curve, giving unified impression to the exterior. The premises is located within a several-minute walk from Musashi-Koyama station and Palm, largest shopping arcade in Tokyo, where convenience and enjoyment of life are scattered in the alleys. This project is aimed to build a flat with distinct presence and comfort in unique environment of the community. Copyright © 2002 - naf architect & design Inc., All Rights Reserved.